Frozen pasta is a fast and convenient ingredient to have on hand for those nights when you need a healthy meal in a hurry. Serving frozen pasta provides the carbohydrates needed for energy, and depending on what tortellini or ravioli are stuffed with, can also offer a serving or two of protein. Cooking frozen pasta is no more or less difficult or complicated than cooking fresh or dried pasta. The key to boiling frozen pasta is to add a minute or two to the usual cooking time. Fill a large pot with water. Frozen pasta like tortellini and ravioli can expand by as much as 50 percent, so make sure that you leave enough room in the pot for this. Bring the water to a full, rolling boil. Putting the pasta in the pot before a full boil is achieved can make for mushy pasta that sticks to itself. Add the frozen pasta, stirring it gently with a wooden spoon as you add it to the water. A pasta spoon has a hole in the center, which makes it easier to move through the water. Set a timer to avoid overcooking the pasta. Tortellini and ravioli generally take about 5 to 7 minutes to cook. Frozen fettuccine will take slightly more time, and thinner noodles will take less. Test for doneness by scooping out a little pasta, running it under cool water and tasting it. The pasta should be soft, with no hint of crunch. Pour the pasta into a colander and shake it gently to drain out all of the water. Toss it with a drizzle of olive oil to keep it from sticking together as it cools. 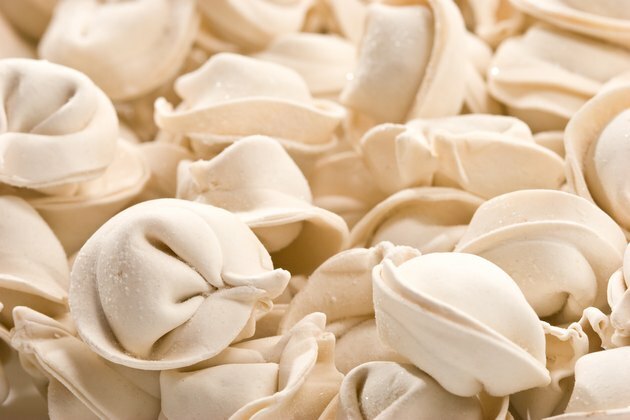 Add frozen tortellini to soups as an interesting change from plain egg noodles. Never thaw frozen pasta before cooking it, as this can ruin the texture.